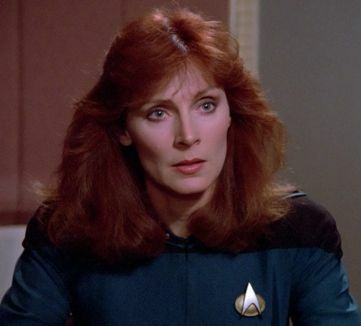 Doctor Crusher was appointed chief medical officer of the Starship Enterprise-D in 2364, and joined the ship at Farpoint Station with Wesley, reporting on board on stardate 41154. Picard initially had reservations about her presence, but she assured him that the past would have no effect on her duties and she had no problem serving under his command. Crusher had to deal with various epidemics aboard the Enterprise, including a polywater intoxication in 2364. The affliction was different than that encountered at Psi 2000 by the original Enterprise nearly a century prior, and Crusher had to modify Doctor McCoy's antigen to help her ship. Later that year Beverly along with everyone else on the Enterprise-D was transported to a different quantum reality and the year 2379. There she met not one but three adult versions of her son and a granddaughter from a completely different quantum reality than the three versions Wesley.